Uptake and distribution of water became possible when plants developed roots and xylem. The movement of food and nutrients required the differentiation of phloem. In the more primitive plants the conducting tissues are arranged in a cylinder with phloem surrounding xylem. This is a protostele and is an arrangement that flowering plants have retained in their roots. It allows for vascular continuity to be maintained between the root and the shoot or the shoot and any structures arising from it. If we could have wandered about on earth in the Devonian period the only conspicuous land plants would have been something like the whisk fern, Psilotum. It has virtually no leaves and no roots. It has underground stems from which the above ground parts branch off. Interestingly, the whisk ferns have developed mycorrhizal associations, perhaps they are necessary in the absence of true roots. Psilotum grows wild in Florida woodlands and all members of the division, Psilophyta, today are tropical plants. With the development of proper vascular systems it became possible to supply water to larger leaves: megaphylls were developed, perhaps by the coalescence of smaller microphylls. So, contrary to expectation, compound leaves may have developed before simple leaves. The other thing that becomes apparent as you study the life cycle is that the diploid sporophyte became dominant. Most of the seedless vascular plants are homosporous, the spores grow into a gametophyte that is usually bisexual with both antheridia and archegonia. The development of anatomy, physiology and reproductive mechanisms adapted to life on the land permitted an explosion of three divisions of plant life which survive to this day although they have been overshadowed by the success of the flowering plants. It probably took the animals time to catch up with the opportunity provided by this new development and perhaps that is why the Upper Carboniferous or Pennsylvanian period was the highpoint of the earth's photosynthetic productivity. We are using the remains of that productivity today. The coal measure forests were dominated by tree ferns, horsetails and clubmosses. There are no truly woody members of these divisions alive today. (The stems of living "tree ferns" are supported by a dense mass of roots). 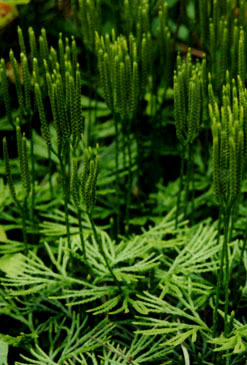 The Lycophyta include Lycopodium and Selaginella. Lycopodium species can be found in Ohio, and throughout the world - in a wide range of habitats but usually growing beneath other plants. They have rhizomes from which arise adventitious roots; the stems are clothed in microphylls. Sporangia may be spread all over the plant or they may be clustered in a cone-like strobilus. Lycopodium is used by florists to some extent as a foliage plant. Running pine is sometimes classified as Diphasiastrum rather than Lycopodium and can be used as a ground cover in the landscape. Running pine or Lycopodium complanatum, an Ohio native. Selaginella species are mostly tropical; they are similar in structure to Lycopodium but rather more delicate and they usually grow in damp places. A big difference from Lycopodium is that they are heterosporous. The strobilus contains micro- and mega-sporophylls. They find some use as an indoor "ground-cover" plant in interiorscapes. The Sphenophyta are represented today by one genus, Equisetum the horsetails or scouring rushes. These are widely distributed, usually growing in marshes and waterlogged soil. The plant is essentially stem, it has a rhizome which puts out adventitious roots. The leaves are a whorl of non-photosynthetic scales at each node. Some species produce lots of feathery branches. Their cell walls contain silica which makes the stems coarse textured, and led to their use as a natural scouring pad for cook ware. Spores are produced in strobili and although the plant is homosporous the gametophytes are unisexual. Horsetails can be aggressive and troublesome weeds, although they are sold for water gardens and have some decorative value if they can be kept within bounds.